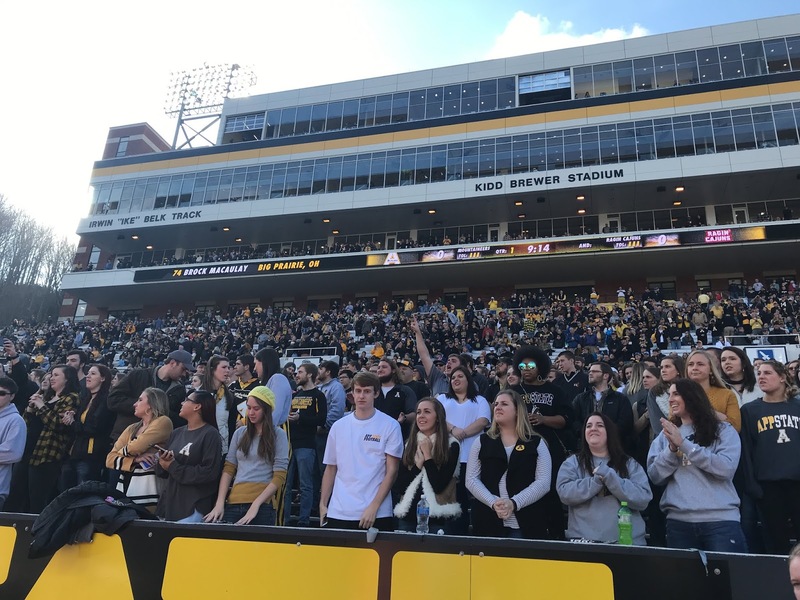 BOONE – Everything was going right for Appalachian State on Saturday afternoon for the Mountaineers' home opener against in-state FCS opponent Gardner-Webb. When Dominique Heath raced down the sideline one minute into the game to score the first points of the game, it was no looking back and the Mountaineers poured it on, gaining 692 total yards (401 yards in the first half) and cruising to a 72-7 win over the visiting Runnin' Bulldogs at Kidd Brewer Stadium. Appalachian State students showed their spirit during the Mountaineers' home opener. 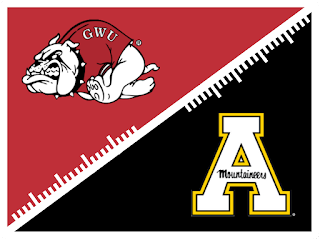 App State would defeat Gardner-Webb 72-7. Showing true to their #10Strong campaign where all ten positions groups work together for success, the Mountaineers thrived in all three phases of the game. While the scoreboard made it obvious that the App State offense was clicking, the defense kept Gardner-Webb in check, only allowing 160 yards in the game. Special teams proved to be special in their own way, accounting for two touchdowns in the game. On the second possession of the game, Gardner-Webb was pinned deep and was unable to move the ball and was forced to punt from its own end zone. App State brought the pressure and redshirt freshman Steven Jones got his hand on the ball and recovered in the end zone for the touchdown, the first time App State has scored a touchdown on a blocked punt since 2001. Jones added another punt block in the second quarter, making him only the third player in Appalachian State history to block two punts in a game. Steven Jones (Richmond) – blocked two punts in the first half, recovering the first one in the end zone for a touchdown. Dominique Heath (Hopewell) – had four receptions for 111 yards and two touchdowns. Jonathan Blackmon (Terry Sanford) caught nine passes for 59 yards and Gardner-Webb's only score of the day. With the win, Appalachian State is now 66-20-2 in home openers. After going 14-14 passing in his previous game, quarterback Zac Thomas went 11-15 against Gardner-Webb, keeping his passing completion rate above 75% for the season. The 72 points scored by Appalachian State is the third highest in Mountaineer football history, behind 79 against Western Carolina in 2007 and 115 against Piedmont in 1936. Jalin Moore's 119 yards and two touchdowns in the first quarter gave him his 16th 100+ yard game in his career. Appalachian State played four quarterbacks during the game and each quarterback had at least one completion, finishing 20-27 as a group. 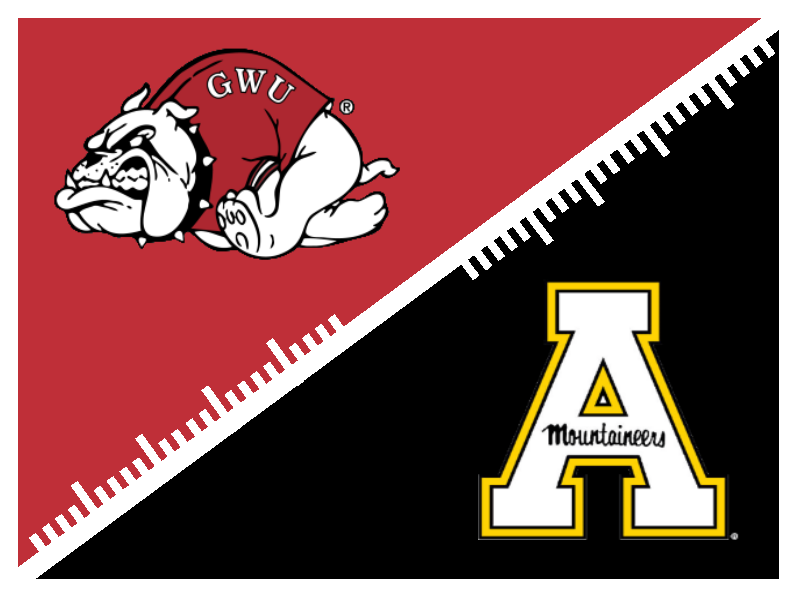 Appalachian State (2-1) hosts South Alabama in the Mountaineers' Sun Belt conference opener while Gardner-Webb (1-3) plays Wofford in nonconference action.